In Pennsylvania, a teacher is required to take courses equaling 6 credits, or 180 hours every five years to keep their teaching certificate active. My five years is up in June of 2010 so I have started some home courses. I was thinking if I have an "AHA moment" I would like to share it. I have just finished the first course entitled "Imagination at Play: Pretend and Dramatic Play in Early Childhood." Well I had several "AHA moments," there are so many great points to share. I am going to try to do it without being preachy, and I will do it in various posts. This was actually the shortest course(that's why I did it first), so I am a little worried about how many AHA moments are going to be in the other courses. Oh well, I do feel strongly about sharing this with the many wonderful moms, dads, grandmoms, grandpops, teachers, college "kids", etc....anyone that will work with children. I always feel if I know something that might be beneficial to the children that someone else might be able to use, it should be shared. I am going to start with pretend play. The first article in the course was "Reclaiming Play: Helping Children Learn and Thrive in School," by Nancy Carlsson-Paige. First and foremost for all to remember, PLAY IN ONE OF CHILDREN'S MOST VALUABLE RESOURCES. Play is vital to children's social, emotional, and cognitive growth. There is also compelling research showing that play is essential for children's academic success. (Why haven't our top educators read about this?) As many of us know, play is becoming almost non-existent in the public schools and even some preschools don't incorporate it as much as they used to, and that is sad. One thing I found very interesting was, that in the mid-1980's , children's television was deregulated and it became legal to market toys and products to children that were directly tied to television. Since this time there has been significant changes in children's play. The play is less spontaneous, and more conforming to medial models, or the television programs the toys are created after. Their play now imitates movies, TV shows, or computer or electronic media. So what can we as guides to young children do? First of all, we need to bring back play. The children need "long blocks of time that allow them to get deeply engrossed in play." We also need to incorporate open-ended materials such as blocks, play dough, building and collage materials, generic dolls, animals. These items foster extended play and imagination. The toys are non-specific and allow children to use them as they see fit. It also allows the children to work on concepts at their developmental level. Another important aspect in pretend play in that it allows children to take worldly experiences and transform them into something new that they understand. They re-order things in terms that make sense to them which helps them to gain mastery over these new challenges. Through play the children continually return to emotional and mental balance that enables them to be ready to learn. behavior. When children play it is definite that conflicts are going to arise. We need to make sure that these conflicts provide an opening to teach skills about getting along. Instead of directing children in which way to go or what to do, we need to ask them questions about what they think should be done. By asking questions, we "stimulate children's thinking and encourage them to invent for themselves the words to say, helping them to build communication skills. By giving children non-specific materials to play with, providing long periods of time when children can be engrossed in play, and helping them to resolve the conflicts during play with communication, we are helping children grow in all areas of life. We build communication skills, help them grow in academic areas, and allow them to regain control of situations by letting them reorder things in terms they understand. By improving all these areas the children are able to get along better with others, and learn more effectively. PLAY IS IMPORTANT! One of my readers just suggested this to me, it is called the Carnival of Play over at PhD in Parenting. If you get a chance, take a look. I couldn't agree more. I didn't really understand this though until after I had my girls, which is really unfortunate for all the kids I taught before. Awesome! Thanks for sharing. I recently visited a Reggio School and the had TONS of open ended objects. The theory sounds great. I ASPIRE to be a teacher like that. It is so hard to break out of " theme" mode. Great post! I have to take my credits by next year, too! I'm trying to find courses that are affordable. beautifully written. i know how relaxing it is for me to just pick up a brush and paint or unwind by climbing the monkey bars and going down the slide (i LOVE to play!) so i know it it helps me, its gotta help the little ones! i also like what you wrote about open-ended toys- we as a society get caught up thinking that our toys entertain while it should be more about the interaction between the child and the toy. Thanks for posting this! I totally agree!!! Where are you taking your classes through? I have to take some soon. Funny you should post this today. I am a homeschooling mom. I read several blogs, some related to homeschooling and some not. One blogger is starting a preschool in her home. She asked for feedback from homeschoooling moms for curriculum recommendations for 2-4 year olds. Curriculum?! Really?! I was nice about it and suggested reading stories, doing crafts, etc. about things the children find interesting. I don't recommend curriculum for children that young. Thank you for your post. It was beautiful! It is critical that people remember the importance of play. This is a fantastic post! You have such good things to say! 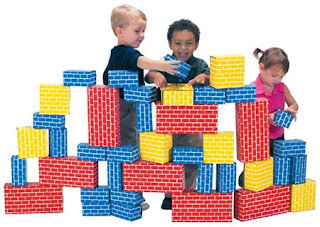 Play IS important and it is important to provide toys that promote imagination and socio-dramatic interaction with things like blocks and costumes, etc. Thanks for this, I think I'll be linking this Sunday! Learning through play is very important and is a vastly under used method in my opinion. Here in the UK, nursery and foundation school children have lots of activities based around play so they don't even know they are learning! great blog too. My wife is a teaching assistant and I will be bookmarking site site for her.